While some might complain that N++ is more of the same, the truth of the matter is it’s one of the most carefully crafted games out there. It's pure platforming paradise, not to mention insanely addicting. At this point, I don’t think there’s anything else I can say about 2D platformers that hasn’t already been said about the genre as a whole. I think it’s safe to say that just about everyone who’s remotely interested in video games has played one at some point, even if it was just for a few minutes, or on a smartphone. 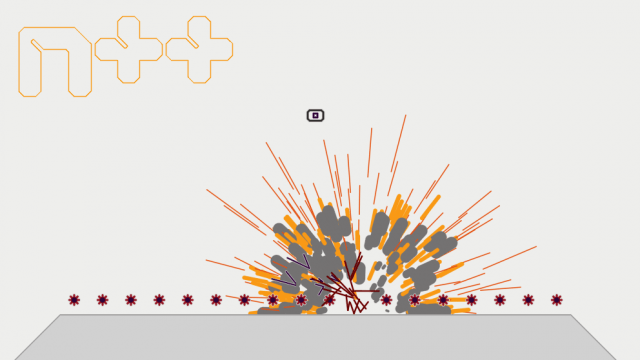 Granted, N++ is not your typical platforming game. More in line with something like Super Meat Boy than a Super Mario Bros. game, the series has seen a surprising amount of success, considering its first outing took the form of a free online flash game (not unlike Super Meat Boy). It’s been over seven years since the release of N+, but to be honest, not much has changed since then. You play as a small, vector-drawn ninja, who must navigate a slew of hazardous levels while grabbing up as much gold as you can in order to extend your time limit. It’s a very simple game; one that relies on a single jump button and the mastery of its momentum based platforming. 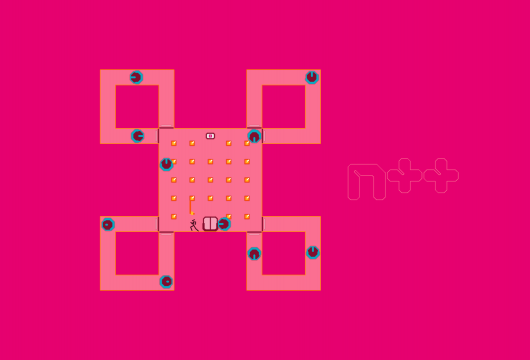 This might sound simple to the point of criticism, but N++ manages to get a lot of mileage out of its simple control scheme, thanks in part to the way the ninja controls and handles. Like most games, holding down the jump button longer will result in a higher jump with more air time, but what plays more of a role is your speed. Initiating a jump after a quick run will net you much more verticality than a standalone jump would have, and there’s a lot of experimentation to be had. Jumping off walls and inclines also results in different trajectories, though the game’s early stages to a formidable job of introducing you to all of these concepts. 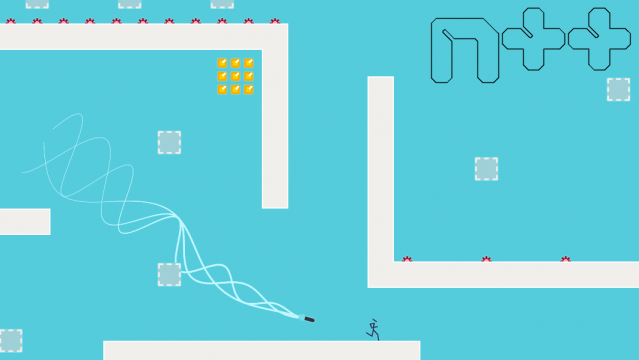 Fluid and solid controls are only one part of any platforming game, though N++ doesn’t falter when it comes to level design. While plenty of games simply throw a handful of obstacles between you and the end of a level, developer Metanet demands a little more from its audience. Rather than jumping into a level headfirst, taking a few moments to suss out the challenge at hand will often prove more fruitful in the long run. Granted, this stems from just how difficult this game can get. If you’ve played any of the other games in the series, you’ll know exactly where you stand, but for the newcomers, I’ll give a fair warning: N++ is not screwing around. Lasers, electrical traps, land mines, heat-seeking missiles, shadow clones. The list goes on and on, but needless to say, the question is not whether or not you’ll die, but simply how often. As a fan of punishing games myself, I take no issue with this crushing level of difficulty, but from an outsider’s perspective, I can easily see how N++ and its uncompromising approach to gameplay might deter some from taking the plunge. To its benefit, however, the game does a formidable job of easing you into the experience. There are plenty of tutorial/intro levels to work through, which slowly introduce you to the core concepts of momentum and jumping. Levels are also broken up into episodes, which consist of five stages at a time. A timer does countdown as you work your way through an episode, though intrepid players can extend that time by collecting gold that is strewn throughout each level (which also serves as a collectible, for the completionist at heart). The standard solo levels should keep you busy for some time (aside from the 125 intro levels, there are 600 new and 600 ‘legacy’ levels), though there are just under 500 co-op stages to try your hand at if you feel like bringing someone along for the ride. Race levels are also fun (the name ‘race’ pretty much says it all), though you can play these solo if you don’t have anyone to race against. For those with a creative side, a robust level editor allows you to build your own levels and share them online, though it should be noted that actually playing levels can only be done offline. This means co-op is relegated to couch play only. Still, I doubt that I would play N++ online even if the option was available, as it’s the kind of game that’s best played with someone on your side. Sure, playing online with voice chat might be the latest craze, but every so often it’s refreshing to play a no-frills game that accomplishes exactly what it set out to do. And after all, the only thing better than finally beating a level after the hundredth attempt is doing so with someone else. This review is based on the PlayStation 4 version of the game, which we were provided with for review.